Pam feels like they're abandoning Cody. Cody points out that she lived in America for two years without them, and they all survived (survived perhaps not being the best choice of word...America might not have finished you off, but two more years on Ramsay Street will, Codes..!). Doug thinks that placing Cody in the care of a neighbour doesn't constitute abandoning her. Cody tells Pam to give her one good reason why she can't go to Darwin with Doug. Pam sighs and eventually admits that there isn't one. PAM: ...except... ...I'll miss you. They hug, as Doug pulls out a book from the packing and starts to chuckle at it. Pam hits him and tells him to get on with the packing! Philip, Debbie and Helen are sitting together, looking at some photographs that Rosemary has sent over. Philip tells Debbie that until the photographs arrived, he was living blissfully in denial that she was going away. DEBBIE: (hugging him) Oh, I'll be ok, Dad. PHILIP: I'm not worried about you. It's just that Julie will have one less person to yell at. Guess who's gonna cop your share?! They all start to laugh. Julie walks in from the garden and they all stop laughing. Her face falls. JULIE: Laughing behind my back, were you? PHILIP: (muttering) Pretty hard to laugh when you're around. JULIE: Philip, I'm sick and tired of you holding me completely responsible for the tension in this house. PHILIP: Well, you're the one who's always flying off the handle! JULIE: If I do, it's because of sheer frustration. You never listen to a word I say! PHILIP: I do nothing *but* listen! You lay down the law and try TO TURN ME INTO SOMEONE I'M NOT! HELEN: I can't cope with this again. I'm going out. Debbie and Helen both leave. PHILIP: See! Nobody can bear to be in this house any more - including me! He gets up and makes his way to the living room. JULIE: Philip. I want you to stay. I think we should have this out, once and for all. He storms off. Julie is very angry. Philip walks towards the front door. Julie follows him into the living room. JULIE: Philip, if you walk out that door again! He looks at her and then walks out. Julie looks exasperated. Marlene says that she's surprised that Pam agreed to let Cody stay at her house as she didn't take the news very well. Cody tells her not to take it personally - Pam's just feeling guilty about leaving her behind. Marlene says she understands and they'll all get along great. MARLENE: Fun? Now, I don't want you to take advantage of the situation, my girl. I'm going to watch over you with the same eagle eye that your parents have. CODY: They didn't need to - I was the perfect daughter! MARLENE: Oh, well then we won't have any problems, will we? Marlene starts to list a 'few things' that she expects of Cody. Sam interjects and points out that Cody is a big girl now! Marlene says that she's not going to let Pam and Doug down. Cody looks concerned. Marlene starts saying that she wants her home at 9pm on weekdays and 10.30pm on weekends. Sam cracks up laughing. Marlene starts to go on about chores, and Cody volunteers to dust her ornaments and furniture. Marlene is quite taken by the fact that Cody likes her things, even though it's clear that Cody is saying it just to get on Marlene's good side. CODY: Every piece tells a story. Marlene says that if she gets her bric-a-brac shop sorted, Cody could work there part time. Cody thinks this is great as she could do with the extra money. Marlene says that Cody should come out to the garage because she's got some stuff that Cody would adore. Behind Marlene's back, Cody pulls a face at Sam! Marlene says that they ought to throw a party for Pam and Doug. Sam enquires what's happened to the rules and regulations, but Marlene reckons that they should just make them up as they go along. Cody sticks two thumbs up at Sam - clearly her ruse worked! Doug is explaining his sticker system for his packing to go to Darwin to Philip and Debbie. He tells them to sell everything else, apart from the stuff with red stickers on as that's going into storage. Pam thinks Doug's confusing Philip! Philip insists he understands and says that Cody can help him if need be. Doug says that Cody is going to keep an eye on 28 until it is sold. He's given Philip's number to the estate agent, and they'll contact him if there's any trouble. Doug says that they're not going to accept anything under the reserve...at least, not for a while! Pam interjects, saying that Philip has enough on his plate at the moment but Philip thinks it's the least he can do considering they haven't given them a farewell party. Pam is relieved that they haven't because she'd be in tears. Debbie reminds her that she'll be closer to Gaby and Zac. PAM: Yeah...but I wish I could take you all with me! PHILIP: (perking up) Good idea! Why don't you take Julie?! DEBBIE: (a bit taken aback) Dad! Doug asks if they're still at odds. Philip tells him that they can't look at each other sideways without starting a major brawl. Rick is enthusing about being with Cody without a nagging parent in sight. He raves about being able to do whatever they want (er, didn't you get that freedom when your parents left last year, Rick?!). Ren tells them to be careful as their folks have spies in the street! Debbie and Sam enter. Debbie says she's been looking all over for Cody. Sam teases her about romancing with Rick and threatens to tell Marlene. Cody reckons she's won Marlene over as she's even going to throw a party for Doug and Pam, which'll be held tomorrow night. Debbie asks what's going to happen about the murder mystery weekend considering that Doug and Pam won't be there and Brett's dropped out because he's mourning over the loss of Lata. Sam suggests that Ren should come along. 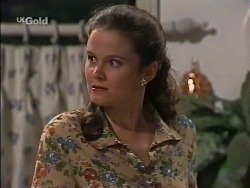 She agrees and Cody suggests that she take over Pam's character, who is a mistress to a character called Nigel. Ren jokes that it'll be ok as long as the Nigel isn't a real Nigel. Everyone laughs and Sam enthusiastically suggests that he could play Nigel, and then Ren wouldn't get stuck with someone duff. Debbie tells him to stick with his own character, else it'll be too confusing. Philip and Pam enter, laughing away. Philip shouts for Julie. JULIE: So, you do come home eventually. Philip's good mood rapidly fades! Pam apologises for barging in, but says that she was worried that she wouldn't get chance to say goodbye. 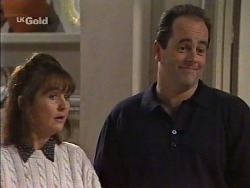 Julie is shocked to hear that she's going away - moreso when she realises that Pam's going with Doug to Darwin. Pam explains that although the plan was to stay behind with Cody, Marlene's offered to take her in. JULIE: (interrupting) No, not that. I mean, you leaving so soon. We should give you a proper send-off. PHILIP: Oh, they don't want to make a fuss! PAM: No, and we cracked a bottle of champagne with Philip at least. JULIE: Oh. So that's where you went. To the Willises. After you stormed out. Did you stop to think whether I would have liked to have gone too? PHILIP: (with little emotion) And ruin everybody's night? JULIE: (furiously) It's not enough you've turned my whole family against me, you're now trying to osctracise me from my friends. PHILIP: You didn't need any help in that department. Pam looks very uncomfortable. Julie looks at him in disgust. Philip doesn't seem to care one bit! JULIE: You make me sick. PAM: Umm, um, I'll leave. PHILIP: (cheerfully) No, it's all right, Pam - I'll go to bed! Good night! See you in the morning! He leaves. Julie is very upset. She points out that Philip didn't say good night to her, or even glance in her direction. Pam starts to say that they're going through a rough patch, but Julie angrily drops the knife she's using to peel fruit and tells Pam not to patronise her. JULIE: It's more than that. And you know it. PAM: (hesitantly) Well, yes, it does seem pretty serious. JULIE: Serious? I'll say it's serious. ...and it scares me, Pam. I don't even know how it started. Before I knew it, everything was completely out of control. And now there doesn't seem to be any way to stop it. Julie tears into her orange with her knife, looking very very distressed. JULIE: (interrupting) Oh, please. It's too late for that. Philip's doesn't care about our marriage any more. Julie stands by the counter, next to a pile of drinking glasses. Pam stands next to her. PAM: Oh, hun, I'm sure he does. Deep down. JULIE: (tearfully) I can see it in his eyes. The way he looks at me. He wouldn't care if I was dead! JULIE: I know that it sounds melodramatic, Pam, but it's how I feel. He hates me. PAM: I'm sure he doesn't. JULIE: And I hate him too! Accidentally, she knocks a glass off the counter and it smashes on the floor. JULIE: I hate him. Hate him. She picks up a glass and throws it angrily onto the floor. Although Pam tries to stop her, Julie smashes all of the glasses one by one. A hippy enters and picks up Ren, who's stoked to see him. He says that 3 years has been long enough in between visits. She introduces him to Rick - his name is Paulo and he's an old friend of the family. Ren tells Rick that Paulo makes jewellery and also imports it from South America. Ren says that he sells it at markets all over the world and that's how he met her parents. Ren asks if he'd heard about her mum's death, and Paulo tells her that he's been with Dave over the last few weeks. Ren asks if he's ok and Paulo reckons so. She invites him to stay and says that Mark is overseas, although he wouldn't mind anyway. They make arrangements for him to pitch his tent in the back garden. Rick thinks that Ren could at least offer him the couch, but Paulo prefers being outside. 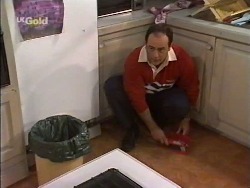 Philip is clearing up the broken glass. 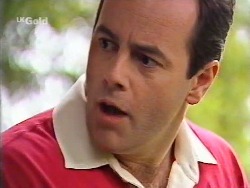 He apologises to Helen. Helen says that they're only things - she's more concerned about Julie and what drove her to behave in such a manner. Philip says that Pam reckons Julie has a lot of anger and frustration pent up inside, but he reckons that they knew that already. HELEN: Yes, but not to this extent. We know she's highly strung but she's always managed to keep things in some sort of perspective. I'm so worried she's going over the edge. PHILIP: ...do you think I'm the one who's pushing her? HELEN: It's not your fault. PHILIP: Well, it is in a way. I'm causing this marriage to break down. HELEN: Philip! What a thing to suggest! PHILIP: Well, it's true. Julie's not doing anything differently. It's me. I've snapped. I'm not going to let her push me around any more. HELEN: But you have the right to change things if you're not happy. PHILIP: Yes, but Julie's not going to change. That's obvious. (he sighs) She doesn't even know what she's doing is wrong. I mean, what hope have I got? HELEN: ...or not. And you won't? PHILIP: I can't. Not any more. I can't go back to the way it was. Helen looks very saddened. Philip is clearly upset and confused by the whole situation too. HELEN: So what happens now? 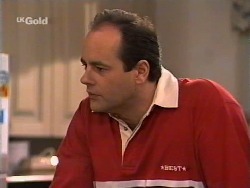 PHILIP: ...I was thinking separation...then divorce. PHILIP: ...oh, Helen, I don't know. I don't know what's going to happen. Marlene is talking about getting a bric-a-brac shop. Sam is just pleased that she's getting rid of all of it out of the garage! Marlene tells him that the so-called junk in the garage is going to provide them with a better standard of living. Marlene thinks that his tune will change when the dollars come in. Sam warns her not to get her hopes too high as it might take a while to get established. Marlene says that the income isn't important - it's the fact that she'll enjoy it. Sam thinks that's good and they hug. Paulo has brought some herbs for Helen. He talks about the trouble Helen had last time she received a package in the mail. Helen doesn't seem too keen to be reminded(!) Julie and Philip walk in. JULIE: I'm sorry to interrupt but we're having afternoon tea now. REN: (pleased) Oh great, thank you. In here? JULIE: Oh, if you don't mind, we've got family matters to discuss. Philip frowns. Ren looks embarrassed. PAULO: She's asking us to leave, Ren. Come on. HELEN: Nonsense! You're certainly welcome to stay and have afternoon tea! JULIE: Gran! I *need* to talk to you and Philip about last night. PHILIP: (annoyed) It can wait! JULIE: (coldly) *No*, it can't. I'm sick of you putting me on hold as if I don't matter. PHILIP: Julie, we have company. Paulo and Ren look very uncomfortable. JULIE: Oh. So now I even come second to some shabby looking hippy you don't even know! Julie storms off into the kitchen. 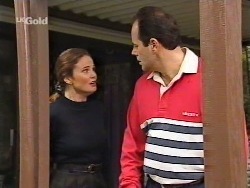 Philip apologises to Ren and Paulo and Helen sees them to the door. Philip walks into the kitchen where Julie is preparing afternoon tea. PHILIP: How dare you be so rude to Paulo like that? What on earth has got into you? (getting annoyed) Or are you so insane you can't explain your actions any more?! JULIE: Are you calling me insane? PHILIP: Well, it's pretty obvious that there's *something* wrong with you, Julie! He angrily storms off into the garden. Julie turns the kettle off and starts to pour the water into a cup. She suddenly thinks better of it and storms out of the house, brandishing the kettle. Philip is digging over the worms in his wormery. He looks up when Julie comes out and storms over to him. JULIE: I'll tell you what's wrong with me! It's YOU. You and Gran and everybody else conspiring against me. PHILIP: Listen to yourself - you're paranoid! JULIE: I've got every reason to be! They're all on your side! Oh yes, you're just a hard done by husband but I'm the wicked witch! Philip turns and looks at her sharply. PHILIP: Maybe it's because you go around smashing glasses and insulting guests AND YELLING AT EVERYBODY ALL THE TIME! JULIE: I'm only reacting to the way that you're treating me. Philip doesn't acknowledge her and continues to angrily dig over his worms. JULIE: Philip! You just don't care about our marriage any more! Philip stops and stares at her in utter disbelief. PHILIP: Have you stopped to consider that *you* may be accountable for what's happening to us. JULIE: Well, of course I've considered it. Julie suddenly shuts up. Philip looks at her - aghast - as he realises what she was about to say. PHILIP: PERMISSION?! IS THAT WHAT YOU WERE GOING TO SAY?! JULIE: You know what I mean. Julie storms off back to the house. Philip yells after her. PHILIP: OH YEAH, I KNOW WHAT YOU MEAN, JULIE. GET OUT OF MY SIGHT! Julie stops and glares at him. JULIE: I haven't finished yet. JULIE: ...Philip, look at me. Philip furiously digs over his wormery (I'm sure they must all have been speared to death by now!). JULIE: PHILIP, I'M TALKING TO YOU! He doesn't respond at all. Eventually, Julie sees red and runs towards him, pushing him out of the way of his wormery. She deliberately pours boiling water all over his wormery. He unsuccessfully tries to get her to stop. JULIE: Maybe now you'll get your priorities straight! She angrily throws the kettle into the wormery too (just in case they haven't been speared or boiled to death, I assume) and storms off. Philip watches her go. Cody is moving her things in. She tells Sam not to worry and that it's all going in her bedroom. Marlene says that it's just as well, as they'll have a hoard of party goers there soon. Cody thanks her for hosting the party, as she thinks Doug and Pam will be stoked. Marlene says that they can't go without a party and Cody is convinced that they don't suspect a thing. Rick and Paulo come out and Cody talks about them not sitting down as they have to prepare for the party. Ren talks about not working Paulo straight after he's landed in the street as they'll scare him away - Julie was bad enough! 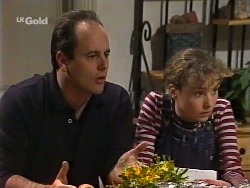 SAM: So how long are you staying in Erinsborough? PAULO: Who knows? A week? A month? A year? PAULO: Well, until Ren gets sick of me. REN: Oh, as if I ever would. It's great having someone around who's on the same wavelength as me. RICK: Oh, don't insult the poor guy! Sam quizzes them on having been friends for a long time and doesn't look at all pleased at his new found competition! It transpires that Paulo is taking Doug's spot in the murder weekend, so he'll be playing Nigel. Sam tries to suggest that it didn't seem like Paulo's cup of tea. PAULO: Nothing like a good murder to make life interesting! He grins. Sam still doesn't look like a happy chappy! Julie is sitting at the kitchen table. Philip walks in with the kettle. Helen looks very puzzled. JULIE: How are the worms? PHILIP: How do you expect them to be? You just poured boiling water all over them. They're dead. PHILIP: You're not sorry. You hated the fact that I had a hobby, so you destroyed it. JULIE: A worm farm's not a hobby. PHILIP: (nastily) It was a distraction from you for a while. JULIE: Yes. Well, at least now I might be able to get your attention. PHILIP: I don't believe it. If you're jealous of worms, you're sicker than I thought. He stalks out. 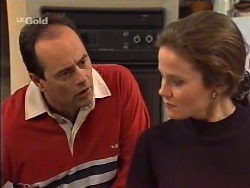 Julie is upset that he keeps accusing her of being mentally ill. She looks at Helen, who looks at her extremely sadly. Everyone has gathered for the farewell party for Doug and Pam. Helen and Marlene chat to each other, whilst Julie keeps looking over at Philip who is laughing along loudly with Debbie, Paulo and Ren. She reckons that Philip is talking about her. Helen isn't impressed at her conclusion! Rick spies them coming over and everyone hides. Cody walks in with Pam and Doug, and Marlene and Sam greet them. Doug says that he hopes Cody won't give them too much trouble and Sam jokes that she'll be out on her ear if she does. 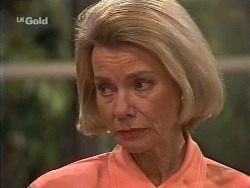 MARLENE: It's a pity you haven't had time to say goodbye to everyone. He and Marlene look at each other. Everyone jumps out with streamers and food. Helen tells Pam and Doug that everyone is going to miss them so much. Pam says that they'll miss them too. PAM: Oh, Doug, I think I'm going to cry! Doug tells her not to because she'll set him off! Everyone hugs. Pam is sitting in a very empty house. PAM: (tearfully) It's hard to imagine there'll be another family living here soon. ...in our house. ...there won't be a trace that we were ever here at all. She sadly shakes her head. PAM: Oh, I didn't expect to get so emotional about a house. ...I feel like I'm saying goodbye to part of me. CODY: You're taking the memories with you. That's the most important thing. DOUG: Well, that's the lot, I hope. He puts his arm around Pam. DOUG: Come on, love. It's time to go. PAM: Oh, I've been dreading this. She approaches Cody, who is on the verge of tears too. PAM: I don't want to say goodbye. ...you ring if you need us, all right? I mean, even if you don't - just for a chat. PAM: Give us a laugh. And if anything goes wrong. With. You know. Well, you let us know. DOUG: Don't think we're not available just because we're not here. CODY: Yeah, I'm aware of that. DOUG: We can be on a plane and back in no time. CODY: Yep. Don't worry about me, I'll be ok.
PAM: Of course you will. CODY: (to Pam) You take care of that big dag. DOUG: Who are you calling a big dag? CODY: Don't worry about me. I love you guys. Helen and Julie are washing up. Julie apologises for breaking Helen's glasses. 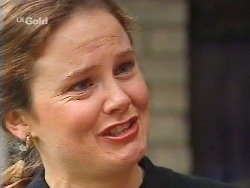 Helen asks why she did it, but Julie confesses that she doesn't know. Julie admits that she was angry at Philip and wasn't unable to get it out of her system. Helen tells her that it was rather extreme. Julie reckons that Philip's behaviour towards her is extreme. She feels that she can't do anything right in his eyes. HELEN: (sighing) Darling, you've been very difficult to get along with lately. JULIE: (surprised) Are you on his side? I'm your granddaughter! HELEN: (sadly) Yes, I know. And I love you very much. That's why I hate to see you acting so...so irrationally. JULIE: Philip's convinced you that I'm crazy. HELEN: Oh darling, I think you have problems. You love to dominate people - especially Philip. And when you don't get your own way, you throw tantrums and you make everyone's life a misery. JULIE: Look, I'm sorry about that. But I think I've had good reason. HELEN: (raising her voice) But there's no excuse for the way you've been behaving. ...I think I can speak for the rest of the family when I say that...we are not prepared to tolerate your behaviour any longer. JULIE: Are you asking me to leave? HELEN: I am asking you - for the sake of the family - to get some psychiatric help. JULIE: (looking appalled) I'll do no such thing! 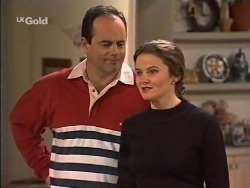 HELEN: (yelling after her) Then you're damned more selfish than I thought! Julie stops and turns back, looking surprised. 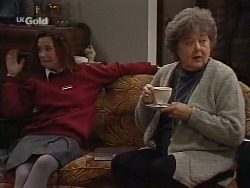 HELEN: And if you continue to behave like this, I don't want you living in this house any longer! Julie looks stunned. Helen looks very upset, but determined.